The MEQ10-50AU passive MMIC equalizer is an ideal solution for compensating for low pass filtering effects in RF/microwave and high speed digital systems. 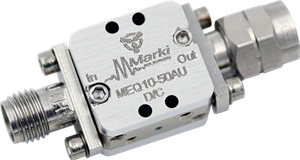 This equalizer provides positive slope from DC to 50 GHz with a DC attenuation value of 10dB and a 50-ohm match maintained over the entire operating range. GaAs MMIC technology provides consistent unit-to-unit performance in a small, low cost form factor. Contact the factory for connectorized versions of our other MEQ products. The electrical specifications apply at TA=+25°C in a 50Ω system. Typical data shown is for the equalizer in a U package with a sine wave input applied to port 1.